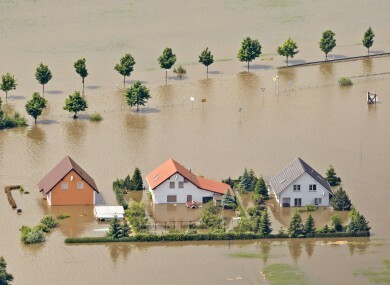 FLOODING HAS DEVASTATED central Europe for more than a week. Swollen rivers in the German states of Saxony-Anhalt and Schleswig-Holstein posed the biggest threat, after flood waters has left at least 19 people dead across Europe. Europe’s top economic power has published no official figure on the cost of the deluge but a private ratings agency said the figure could surpass €12 billion in Germany alone. The German Agricultural Association said sodden fields, destroyed crops and damaged equipment brought losses of €405 million. Some 9,000 soldiers were deployed in Saxony-Anhalt today to ensure dykes held as around 11,300 people remained stranded in provisional housing. Hungarians meanwhile breathed a sigh of relief as the level of the Danube continued to fall to 8.45 metres on Tuesday from 8.81 metres late Monday. Email “In pictures: The floods in central Europe that have killed 19 people so far”. Feedback on “In pictures: The floods in central Europe that have killed 19 people so far”.